Tion Clever is a professional air disinfecting cleaner that effectively removes highly allergenic dust, pollen particles as well as infections, harmful gases and odours from the air. Appropriate for prevention of allergy, asthma, pollinosis as well as droplet infection, also in child care centres. The technology developed specifically for medicine and adapted for use in household premises serves as the basis for operation of the device. Tion Clever cleans the air from dust, allergens, harmful gases (cancerogenes, toxins) and odours. Moreover, it filters the air and inactivates (destructs on filters) any types of microorganisms including highly resistant tuberculosis microbacteria and mold spores. Air cleaners for home present on the market include various filters: coarse (class G3-G4) to high-efficiency HEPA or ULPA filters. They capture not only mechanical particles (dust or allergens) but also airborne microorganisms. However, manufacturers do not take into account the fact that filtration/disinfection of microorganisms on a filter is not sufficient. They should be inactivated (destructed or deprived of the reproduction capability); otherwise the filter will soon turn into a substrate for raising pathogenic microorganisms. Even a good air cleaner with a high level of filtration but without inactivation becomes a nursery for infection. Tion Clever is an absolutely sterile system. Its filters will never become a source of infection despite the operation duration. in ventilation (mold and infections keep reproducing). Tion filters are always sterile due to inactivation. Therefore, no special disposal of filters is required. 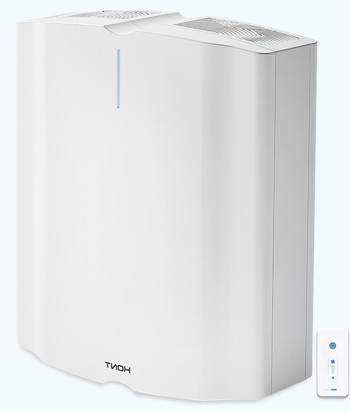 Tion Clever breathes the air through the inlet grating and passes it through a system of filters, cleaning from mechanical and chemical impurities, while inactivating (destructing) all types of microorganisms (including mold spores), and then returns the cleaned air to the premise via outlet port. The pre-filter (1) captures coarse dust and prevents dust, lint and wool from penetrating into the device. While passing through the electrostatic unit (2), the mechanical contaminants and bioaerosols gain an electric charge and are effectively captured on the bulk HEPA filter (3). The electrostatic unit uses ozone produced from oxygen in bactericide concentrations for inactivation (destruction) of viruses, bacteria and mold spores. Due to inactivation the bulk HEPA filter is permanently sterile during operation, including filter replacement (it does not require special methods of disposal for the used filters). Therefore, complete microbiological safety of the filtration system is ensured. Ozone totally decomposes to oxygen while passing through the adsorption-catalytic filter (4), simultaneously speeding up the reactions of destruction of molecular chemical compounds. 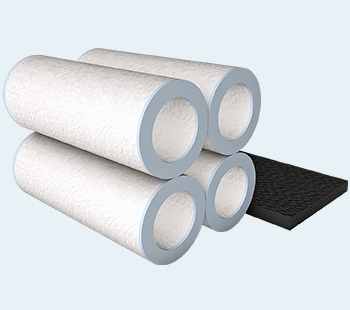 The adsorption-catalytic filter is designed for filtration of harmful substances in gaseous state as well as odours. Ozone concentrations at the device outlet do not exceed MPC (daily average) during the whole lifetime. Therefore, the device can be operated 24 hours a day in the presence of people. When used, the device does not change the microclimatic parameters (temperature, moisture) and the ion composition of the air. A remote controller (5) allows for comfortable use of the device. The air cleaner Tion Clever is installed inside the premise. The wall located away from the entrance door or windows is an optimal place. One should avoid installing the device under air intake ports of the exhaust ventilation. When two Tion Clever devices are installed in the premise, they should be installed as far away from each other as possible (for example, on opposite walls). One device is sufficient for effective cleaning and disinfection of air in an area of up to 20 m2. The optimal number of people in one premise per one cleaner is up to 3 people. An independent air cleaner shall be installed in each premise, even if two neighbouring premises are connected for example by an opening. A zigzag premise shall be divided into several independent zones on the basis of the number of turns, and each zone shall be considered as an independent premise. When a long and narrow corridor is present, its area should be mentally divided into rectangles with the wall ratio no more than 1:4, and each zone shall be considered as an independent premise where an independent device is installed. Inactivation of microorganisms on filters ensures absolute sterility of replaceable elements of Tion Clever and lack of special disposal measures. The body of Tion Clever is made of plastic resistant to disinfectant treatment. The noise level of the Tion Clever air cleaner is no more than 40 dBA, which corresponds to hygienic norms for medical facilities and makes the use of Tion Clever comfortable both at day and night. Tion will not interrupt your sleep. The recommended operational mode is around the clock. The device is equipped with a remote controller, allowing for suspending of the air cleaner under the ceiling. Tion Clever maintenance consists in regular cleaning of the electrostatic unit, replacement of the preliminary filter and bulk HEPA filters with adsorption-catalytic filters accumulating contaminants. It can be maintained unassisted. A signal on the device indication panel will notify about the necessity of maintenance 30 days prior to it. If you want to buy equipment or get advice, please leave your name and phone number in the message window. Our managers will contact you.